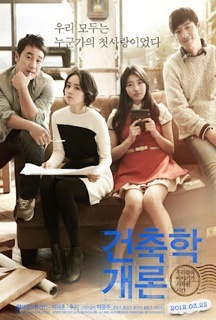 Review: “Architecture 101” is a Korean film that combines romance with architecture. A friendship between a girl and a boy ended 15 years ago in college, in harsh circumstances. Seung-Min, now an architect, was surprised by Seo-Yeon when she appears in his office asking him to build the house of her dreams. At the sound of cheesy tunes, the storyline moves back and forth in time, invoking nostalgic feelings and reviving the 90's. Clearly targeting juvenile audiences, this romance wasn’t sufficiently refreshing or exceptional to get me involved. Architecturally speaking, I would say that some basic pillars are missing here: pace, surprise and a better soundtrack, which make this "house" unable to stand up. Despite the huge success in South Korea, "Architecture 101" definitely is not among the best romantic flicks of the last times.